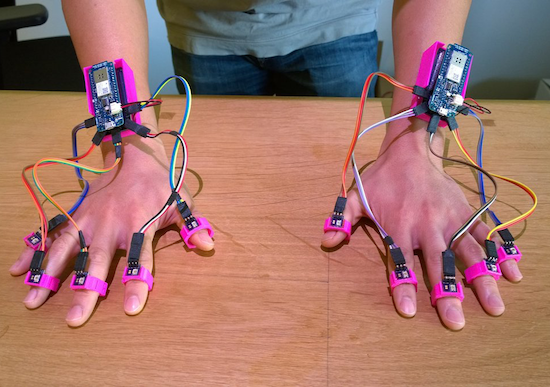 Using a pair of Arduino MKR1000s, researchers at the University of California, Irvine and FX Palo Alto Laboratory have come up with a new way to track 10 fingers to within less than two millimeters. In this technique, called “Lift,” a normal DLP projector is used to display a series of tiny encoded images onto any flat surface. Instead of using an external vision system, or even an accelerometer, Lift employs tiny light sensors on each finger to detect this pattern, then relay this information to the MKR1000 mounted on each wrist. From there, the Arduino is able to translate these light signals into positional data with an average accuracy of 1.7 millimeters and an average refresh rate of 84Hz. By projecting encoded visible patterns onto an object’s surface (e.g. 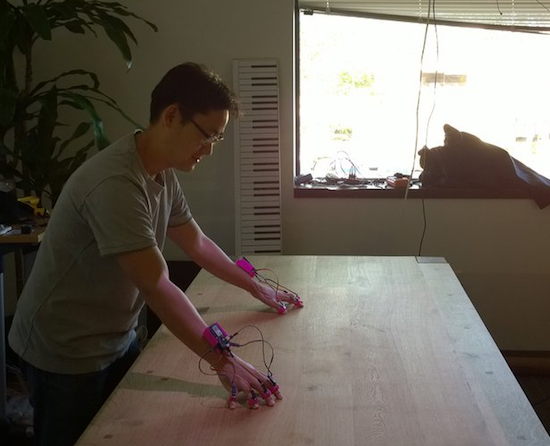 paper, display, or table), and localizing the user’s fingers with light sensors, Lift offers users a richer interactive space than the device’s existing interfaces. Additionally, everyday objects can be augmented by attaching sensor units onto their surface to accept multi-touch gesture input. You can find a quick summary of this project here, and download the team’s entire paper to learn more.